Starting last season in the Blind Fate Amphitheater, Smugglers Notch, with Mammut Ambassador Alden Pellett. Martin was clearly struggling—and it wasn't like him. True, it was his first outing of the season, but the previous season he'd confidently led several Smugglers Notch WI3 pitches and climbed Lake Willoughby WI4 clean, but now, climbing the East Face of Mt. Willard, I was baffled. His feet sputtered and skidded on the ice like he'd forgotten to don crampons. Kick—pop!...hang. I checked out his foot technique and stance—it looked good. We checked out his crampons—sharpened to laser edges—Martin is an efficiency engineer, an Austrian...and zealous about sharpening. It wasn't until later in the day that I glanced at his tools. “Martin, looks like you snapped a pick,” I was about to comment, but then I noticed the other tool was the same way. Turns out, Martin's zealousness with sharpening had rendered his picks stumps of their former selves. Suddenly it was clear: his foot work was fine, but in order to understand why his feet kept popping out, we had to look at the impact his filed-off picks were having on his upper body. Those filed-off picks had no purchase. Feeling that insecurity, he pulled his upper body way too far into the wall. Consequently, his crampons were forced out away from the wall, and he was tossed down that same wall. Same goes in ice climbing. When assessing technique flaws, don't look for the obvious answers, because the body is a system and what happens in one remote locale will affect things far elsewhere. 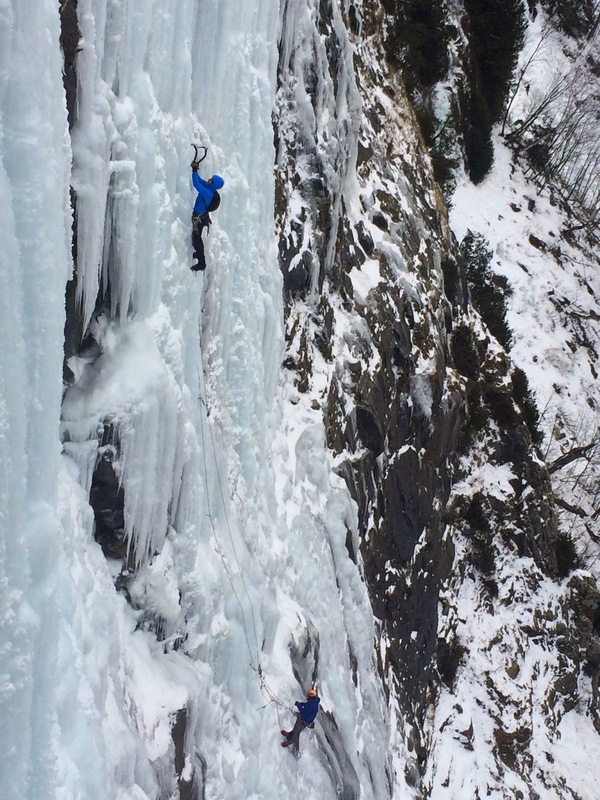 Ice climbing is not atomistic, it's holistic. If you want to understand what's going on, you have to look big picture. Approach things with a big-picture framework in order to understand and work on the parts. Ramping things up on Glass Menagerie (WI5), Lake Willoughby. Concept: Pay Attention to the Parts. Above I counseled about looking at the big picture. Now I'll recommend just the opposite. All nifty aphorisms have their limit, and perhaps each inevitably contains its opposite. So while I've been reminded to look at the big picture, I've also been reminded of the need to pay attention to the parts. Not too far into things two seasons back, I was hammering my way up a particularly stiff, steep, stout section of Poke-o-Moonshine's “Waterfall Route”. My calves stung like I'd stepped on a wasp nest. But my heels were down, my hips were in...why then the trouble? Without any apparent suspects, I did a body scan: my grip was good, arms straight, shoulders out, heels and hips as noted...but inside my Mammut Nordwand's my toes were clenched tighter than the teeth of a nun whose just been propositioned. That could make some sense with rock shoes on, helping to fine-tune the positioning of the sticky rubber, but it makes none in the stiff sole of a performance climbing boot. All that muscular purpose and energy was going nowhere, so, I relaxed. Nothing changed in my foot security. But my calves were instantly calmed. The fresh ice of Waterfall's upper portion continued to ask for every ounce of swing energy and now I could channel that energy where it was needed most. Paying attention to my toes allowed my calves to stay cool and allowed me to move upwards in good style. Seeing the season clearly on the squeeze in Grand Illusion (WI4+), Smugglers Notch. Not overgripping your tools is obvious to any ice climber. Similarly, for a successful season, it's important not to overgrip life. Two seasons ago, I began with some foot surgery. Unclear of how the healing process would unfold, I didn't set any clear climbing goals. And, without any clear goals, I tended instead toward filling my calendar with work days to the point where any non-climb day was spent drying out and sorting gear, followed by answering emails. Maybe your work doesn't necessitate drying ropes and sorting gear, but perhaps the general gist of this does. While the guiding and instruction I did provided it's own rewards, I also feel that to truly connect with the work that I do, I have to keep myself in the role of the perpetual learner. That's what keeps me connected with climbing. If it were simply about hacking my way to the top of an ice cube I would have lost interest long ago. Monkeys can do that. Monkeys can't reflect on where they are and how they got there and where they want to go. So, last season I scaled back. After I had the bases covered on my guiding calendar, I began practicing how to say “no”. It's not breaking news that too tight a grip on your tools is a bad thing, but it's still so easy to forget deep into the steep. But advice not to over-grip is typically offered in terms of the actual hand and tool. I'm talking about over-gripping life—which is also easy to forget in the deep and the steep of life. 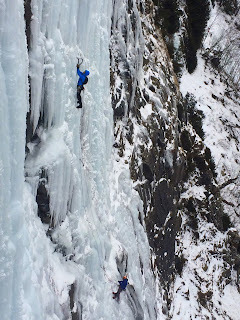 Sometime in the melt-off of that March two years ago, I'd looked back on my season and realized that while I'd been a part of several of my client-climbers' groundbreaking successes during the season, I'd had none myself. As climber, learner, guide, and instructor it feels inauthentic to me if I'm not also staying on the sharp end of challenge and exploration. So last season, I loosened the grip and seized on something more vital. The skylight rappel from the cave-couloir, with climber-client Martin. Climbers are a doing bunch living in a doing culture. Emphasis is put on tick-lists and to-do lists—what you've accomplished today and what's online for tomorrow. And definitely, getting out there and doing it is vital. But that's only half the equation if you really want to progress. As Paul Petzholdt (founder of the National Outdoor Leadership School or NOLS) offered bluntly, “There's a lot of climbers out there who'll tell you they've got twenty years of experience—that's bullsh*t—what they've got is two years of experience and eighteen years of repeatin' the same mistakes.” Experience alone does not lead to learning. I've learned a lot in stepping back to reflect on my previous ice season and the lessons have been large. I look forward to what I'll find in the season to come, frozen in the ice. Wishing you similar visions!